I found a reference for a tarot card from Edith Sherwood's' site and I guess this should go in astrology! The tarot card is similar to f67r2 and it's Ercole l D'Este's card. Oringinal Ercole D'Este full Tarot Deck link. (08-05-2017, 04:04 AM)coded Wrote: You are not allowed to view links. Register or Login to view. I found a reference for a tarot card from Edith Sherwood's' site and I guess this should go in astrology! 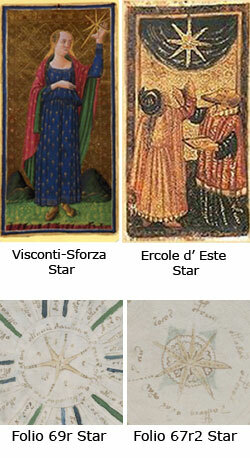 The tarot card is similar to f67r2 and it's Ercole l D'Este's card. How is it similar? The two VMS stars are 6 and 7 points. the d'Este star is 8 points. Even if it did match, you're cherry-picking again. You've decided it's d'Este, so you are looking for images to support your intuition rather than doing actual research into stars. There are thousands with skinny arms and circles in the middle. I'm starting to wonder if you are greatly underestimating our intelligence. The general public with no background in these areas could perhaps be fooled, but there are some very bright, skilled, and well-informed people on this forum and they are not going to fall for this. I think you should treat them with more respect and not waste so much of their time with half-baked ideas. Take some time to come up with something that stands up to critical scrutiny. @ JKP I don't wish to argue with you and I don't know you, but I think your problem is you are not an artist. Perhaps you are then your not familiar with this. Sorry I don't know how to respond to this rude message. (08-05-2017, 08:20 AM)coded Wrote: You are not allowed to view links. Register or Login to view. @ JKP I don't wish to argue with you and I don't know you, but I think your problem is you are not an artist. Perhaps you are then your not familiar with this. Sorry I don't know how to respond to this rude message. I won so many art awards before the age of 24 that I lost count (and many more since then), including national contests. And if you think I'm rude, that's too bad. What I said is not half as rude as the half-baked "findings" you continually post on this board that wastes the time of other researchers who are more thorough and rational about what they post. You posted close-ups of the letters you supposedly found, some of which are not even shaped like Voynich glyphs, they are somewhat "close" but not close enough. You didn't post a wide shot to show how you were choosing (not finding, but choosing) shapes that support your point of view. When other people post speculative information, they make it clear that they're not sure of what it means—which is perfectly fine. You don't do that. You are trying to CONVINCE us you are right by showing only what supports your idea. We all do this occasionally, it's human nature, but you do it habitually. That is not research, that is storytelling. (08-05-2017, 08:43 AM)-JKP- Wrote: You are not allowed to view links. Register or Login to view. Looks like an ego war here maybe we should play Chess online Mr. Artist and I believe your negativity is attached to that over inflated way you put down others. OK I forgot to mention speculation I object to this nonsense of yours. It could be spot on. You are a hot head and I doubt your methods with the way you deal with others except ones you deem worthy of your intellect; that you will ever find one word in the voynich unless its spelled out to you like in the Zodiac series for the months. I like even your post JKP trumpy. Take a hike cool off! Thread descending into flaming - locked and warned. Stellar, JKP is one of the few members who still takes the effort to try and argue with you, the others just look at your umpteenth theory and sigh. JKP is criticizing your methodology (or lack thereof) which is fine, but you must always turn it into something personal. Also, pleeeeeease keep your theorizing out of unrelated threads and stick to the thread about your theory. If you cannot do this, I won't hesitate to ban you again. (08-05-2017, 09:11 AM)Koen Gh. Wrote: You are not allowed to view links. Register or Login to view. Stellar, JKP is one of the few members who still takes the effort to try and argue with you, the others just look at your umpteenth theory and sigh. JKP is criticizing your methodology (or lack thereof) which is fine, but you must always turn it into something personal.